OX40 (CD134) and its ligand (OX40L) have been implicated in T cell activation and migration. In this study, we examined the contribution of these molecules to the pathogenesis of experimental autoimmune encephalomyelitis (EAE) by administering a neutralizing mAb against murine OX40L (RM134L) to proteolipid protein (139–151) peptide-induced EAE in SJL mice. Administration of RM134L effectively ameliorated the disease in both actively induced and adoptively transferred EAE models. Histological examination showed that the RM134L treatment greatly reduced mononuclear cell infiltration into the spinal cord. The RM134L treatment did not inhibit the development of pathogenic T cells, given that proliferative response and IFN-γ production by draining lymph node cells were not reduced or rather enhanced upon restimulation with proteolipid protein (139–151) in vitro, and these cells effectively transferred EAE to naive SJL mice. 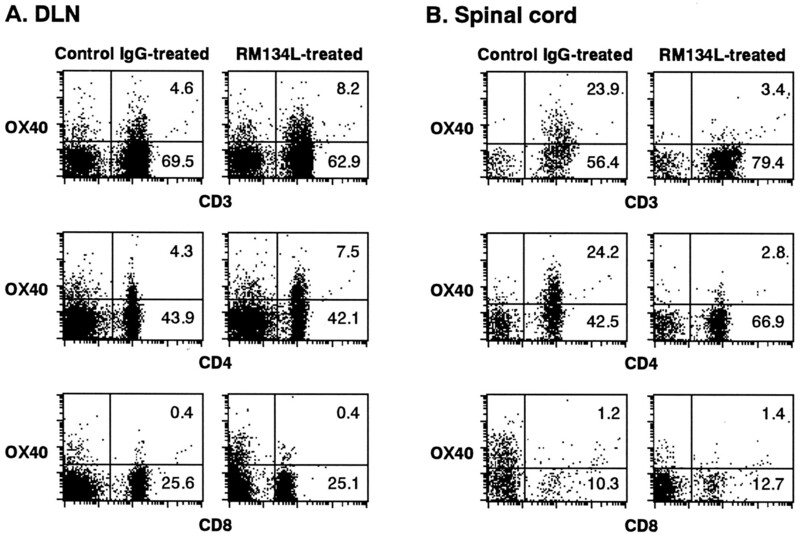 Flow cytometric analyses showed that the RM134L treatment inhibited the accumulation of OX40-expressing CD4+ T cells and the migration of adoptively transferred CD4+ T cells in the spinal cord. Immunohistochemical staining showed that OX40L was most prominently expressed on endothelial cells in the inflamed spinal cord. These results suggest that the OX40/OX40L interaction plays a critical role for the migration of pathogenic T cells into the CNS in the pathogenesis of EAE. The protein OX40 is a member of the TNF receptor family (1) and is primarily expressed on activated CD4+ T cells in the rat system (2) and on activated CD4+ or CD8+ T cells in the mouse and human systems (3, 4, 5). Its ligand (L)3 (OX40L) is a type II membrane protein belonging to the TNF family (6, 7, 8) and is expressed on activated B cells (9, 10, 11), dendritic cells (DC) (12, 13), and endothelial cells (EC) (14). A number of in vitro studies have shown that OX40 provides a costimulatory signal resulting in enhanced T cell proliferation and cytokine production (6, 7, 8). We and others also demonstrated that OX40L expressed on activated B cells and DC did contribute to T cell costimulation by these APCs (11, 12, 13). In some circumstances, it has been suggested that the OX40/OX40L interaction may play a preferential role in the development of Th2 cells (15, 16), and we recently substantiated this by administering a neutralizing anti-OX40L mAb to a murine experimental leishmaniasis model (17). The OX40/OX40L interaction has been also suggested to be important in T cell-dependent Ab production by activated B cells (9, 10) and in migration of OX40+-activated T cells through their interaction with OX40L expressed on activated EC (14). However, very recent studies using OX40- or OX40L-deficient mice revealed a major role of OX40/OX40L in T cell priming by DC in vivo and in enhancing proliferation and production of both Th1 and Th2 cytokines in vitro, but a minor or no role in Th1-, Th2-, or CTL-mediated protection against microbial infections, delayed type hypersensitivity, and humoral immune responses (18, 19, 20, 21). Despite the above progresses in our knowledge about the physiological function of OX40/OX40L, their role in various pathological conditions remains to be determined. It has been shown that OX40+ T cells preferentially accumulated in inflammatory sites associated with various diseases and disease models, including rheumatoid arthritis (RA) (22), inflammatory skin diseases (ISD) (23), graft vs-host disease (GVHD) (24), and experimental autoimmune encephalomyelitis (EAE) (25, 26). In rat EAE models, it has been shown that pathogenic T cells resided in the OX40+ population and that depletion of the OX40+ T cells with anti-OX40 mAb-conjugated immunotoxin effectively ameliorated EAE (27). A more recent study showed that therapeutic administration of soluble OX40-Ig fusion protein at the onset of mouse EAE significantly reduced ongoing signs of disease, possibly due to interference of activation of pathogenic T cells by OX40L+ APC in the CNS (28). In the present study, we examined the contribution of OX40/OX40L to the pathogenesis of EAE, particularly focusing on the development of pathogenic Th1 cells and their migration into the CNS, by administering a neutralizing anti-OX40L mAb to an actively induced or adoptively transferred EAE model in SJL mice. Our present results suggest that OX40/OX40L may play the most critical role at migration of pathogenic T cells into the CNS, because OX40L was most prominently expressed on EC in inflamed CNS and the anti-OX40L mAb treatment efficiently inhibited the accumulation of OX40+ T cells and the migration of adoptively transferred CD4+ T cells in the CNS. Clinical relevancies of the finding are discussed. Female SJL/J mice, 6–10 wk old, were purchased from Charles River (Atsugi, Japan), housed in the animal care facility at the Juntendo University School of Medicine, and used according to the institutional guidelines. A neutralizing mAb against mouse OX40L (RM134L, rat IgG2b) was prepared as described previously (11). Control rat IgG was purchased from Sigma (St. Louis, MO). Purified anti-CD16/32 (2.4G2; FcBlock) mAb, FITC-conjugated anti-CD3 (145-2C11), CD4 (RM4-4), CD8 (53-6.7) mAbs, biotinylated anti-OX40 (MRC OX86) mAb, biotinylated control IgG, and PE-labeled streptavidin were purchased from PharMingen (San Diego, CA). High pressure liquid chromatography-purified proteolipid protein (PLP) peptide (PLP139–151; HSLGKWLGHPDKF) was purchased from Sawady Technology (Tokyo, Japan). To induce active EAE, female SJL/J mice were immunized s.c. with 100 μg PLP139–151 emulsified in CFA containing 200 μg Mycobacterium tuberculosis H37Ra (Difco, Detroit, MI) at four sites in the flank on day 0. Initial clinical signs of disease were usually observed between day 10 and 15 after immunization. These mice were treated i.p. with various doses of anti-OX40L mAb or control IgG daily from day 0 to day 17 when remission was first observed in the control group. For adoptively transferred EAE, SJL/J mice were immunized with PLP139–151/CFA and draining lymph nodes (DLNs) were harvested on day 10. DLN cells (5 × 106/well) were then cultured with PLP139–151 (30 μg/ml) for 4 days. Cells were then washed with PBS, and 3 × 107 cells in 0.5 ml PBS were injected i.p. into naive SJL/J mice on day 0. The recipient mice were treated i.p. with 400 μg anti-OX40L mAb or control IgG daily from day −1 to day 10 when all mice in the control group showed clinical signs of disease. Individual mice were examined daily for clinical signs of neurological deficit scored on a 0–6 scale as follows: grade 0, no abnormality; grade 1, limp tail; grade 2, hind limb weakness (waddling gait); grade 3, partial hind limb paralysis; grade 4, complete hind limb paralysis; grade 5, moribund; grade 6, death. The data are reported as the mean daily clinical score for five animals in each group. For histological evaluation, representative mice from each group were anesthetized and sacrificed by total body perfusion through the left ventricle with 4% paraformaldehyde in PBS. Spinal cords were dissected out, fixed in phosphate-buffered 10% formalin solution, and embedded in paraffin. Thin sections were then stained with hematoxylin and eosin or with Luxol fast blue. Frozen sections of the spinal cord from normal SJL/J mice or the mice with active EAE were stained with anti-OX40L (RM134L) mAb, followed by biotin-conjugated goat anti-rat IgG Ab (Kirkegaard and Perry Laboratories, Gaithersburg, MD) and Vectastain ABC kit (Vector Laboratories, Burlingame, CA), and then diaminobenzidine as a substrate. DLN cells were isolated from PLP139–151-immunized mice on day 10. Cells were cultured in 96-well flat-bottom microculture plates at a density of 5 × 105 cells/well in 200 μl RPMI 1640 supplemented with 10% FCS, 2 mM l-glutamine, 1 mM sodium pyruvate, 50 μM 2-ME, and antibiotics in the presence or absence of 30 μg/ml PLP139–151. To assess proliferative responses, cultures were pulsed with [3H]TdR (0.5 μCi/well; Dupont-NEN, Boston, MA) for the last 16 h of the 96-h culture and harvested on a Micro 96 Harvester (Skatron, Lier, Norway). Incorporated radioactivity was measured on a microplate beta counter (Micro β Plus; Wallac, Turku, Finland). To assess cytokine production, culture supernatants were collected at 24, 48, and 72 h and stored at −80°C until the ELISA. Cell-free culture supernatants were subjected to cytokine-specific ELISA for IL-2, IL-4, IL-10, IFN-γ, and TNF-α according to the protocol recommended by the manufacturer. All anti-mouse cytokine mAbs and cytokine standards were obtained from PharMingen. Dissected spinal cords were first washed in cold RPMI 1640 to remove contaminating blood cells and then homogenized by passage through a wire mesh. The cells were washed in RPMI 1640, resuspended in 80% Percoll (Pharmacia, Uppsala, Sweden), and then overlaid with 40% Percoll to form a discontinuous gradient. The gradient was centrifuged at 1200 × g for 30 min at room temperature. The cells at the 40–80% interface were collected and washed with PBS. DLN cells and spinal cord MNC were first preincubated with anti-CD16/32 mAb to block nonspecific binding of mAb to FcγR and then incubated with biotinylated anti-OX40 mAb or control IgG and FITC-conjugated mAb against CD3, CD4, or CD8 for 30 min at 4°C, followed by PE-conjugated streptavidin. After washing with PBS, the stained cells (live gated on the basis or forward and side scatter profiles and propidium iodide exclusion) were analyzed on a FACScan (Becton Dickinson, San Jose, CA). DLN cells were isolated from PLP139–151-immunized mice on day 10 and then restimulated with PLP139–151 (30 μg/ml) for 3 days. Cells were resuspended at 5 × 107 cells/ml in PBS and incubated for 30 min at 37°C with 10 μM CFSE (Molecular Probes, Eugene, OR). Labeling was terminated by adding 5% final concentration of FCS, and the cells were immediately centrifuged and washed with ice-cold PBS. The CFSE-labeled cells (3 × 107) were injected i.p. into naive SJL/J mice on day 0. The recipient mice were treated i.p. with 400 μg anti-OX40L mAb or control IgG daily from day 0 to day 7 after the transfer. Spinal cord MNC, DLN cells, or spleen cells were isolated from the mice on day 10 and subjected to flow cytometry after staining with PE-conjugated anti-CD4 mAb. The absolute numbers of CFSE+CD4+ T cells in the spinal cord, DLN, and spleen were calculated from the total number of collected MNC and the proportion of CFSE+CD4+ T cells among them. The significance of differences between means was determined using the paired t test and the Mann-Whitney U test. P values of <0.05 were considered as significant. To explore the contribution of OX40/OX40L interaction to the development of EAE, we first administered various doses of a neutralizing anti-OX40L mAb (RM134L) or control rat IgG to PLP139–151/CFA-immunized SJL mice, which develop relapsing-remitting EAE resembling multiple sclerosis (MS) in humans, from the day of immunization (day 0) to day 17 when the remission was first observed in the control group. As shown in Fig. 1⇓A, clinical signs of EAE were first observed on days 11–13, peaked around day 15 (5/5 incidence), remitted once around day 19, and then relapsed around day 23 in the control IgG-treated mice, with disease course and severity comparable with those in the untreated mice (data not shown). In contrast, the RM134L treatment ameliorated the clinical signs of EAE in a dose-dependent manner (Fig. 1⇓A). Low doses (100 or 150 μg/day) were effective in reducing the disease severity at the acute phase (four of five or three of five incidence at day 15, respectively) but not at the subsequent relapse, and high doses (250 or 400 μg/day) were effective at both phases (three of five or three of five incidence at day 15, respectively). Histological examination showed that spinal cord from the control IgG-treated mice at the acute phase (day 16) had massive perivascularly infiltrating MNC, which often extended into the parenchymal white matter (Fig. 2⇓, A and B). In contrast, such mononuclear infiltrates were greatly reduced in spinal cord from the RM134L-treated mice (Fig. 2⇓, C and D). These results indicated a substantial contribution of OX40L to the pathogenesis of actively induced EAE. Amelioration of actively induced or adoptively transferred EAE by treatment with anti-OX40L mAb. A, Actively induced EAE. SJL mice were immunized on day 0 with PLP139–151/CFA and administered i.p. with 250 μg control IgG or the indicated doses of anti-OX40L mAb (RM134L) daily from day 0 to day 17 (arrows). B, Adoptively transferred EAE. DLN cells prepared from PLP139–151/CFA-immunized SJL mice at day 10 were restimulated with PLP139–151 for 4 days in vitro and 3 × 107 cells were injected i.p. into naive SJL mice. These mice were treated i.p. with 400 μg control IgG or RM134L daily from day −1 to day 10 (arrows) after the transfer. In both A and B, the mice were examined daily for clinical manifestation of disease as described in Materials and Methods. Data are indicated as mean clinical score of five mice in each group. Similar results were obtained in three independent experiments. Histopathological examination of spinal cord from control IgG- or anti-OX40L mAb-treated mice. Paraffin sections of the spinal cord from the following mice were stained with hematoxylin and eosin. A and B, Control IgG-treated mouse with active EAE on day 16 (clinical score 4). C and D, Anti-OX40L-treated mouse with active EAE on day 16 (clinical score 1). E and F, Control IgG-treated mouse with adoptive EAE on day 12 (clinical score 4). G and H, Anti-OX40L-treated mouse with adoptive EAE on day 12 (clinical score 1). Representatives of five mice in each group examined. Original magnification, ×20 in A, C, E, and G. B, D, F; H are ×100 original magnification of the boxed portions of A, C, E, and G, respectively. The development of actively induced EAE involves multiple steps, including priming of PLP-reactive T cells in the DLN, migration of primed T cells to the CNS, and reactivation of these cells by APC resident in the CNS. To exclude the possible effect of anti-OX40L mAb treatment on pathogenic T cell priming on PLP139–151 immunization, we also examined the effect of RM134L on adoptively transferred EAE. DLN cells from PLP139–151-immunized SJL mice were restimulated with PLP139–151 in vitro and then injected i.p. into naive SJL mice, which were then treated with RM134L or control IgG from 1 day before the transfer (day −1) to day 10 when all mice in the control IgG-treated group showed clinical signs of EAE as shown in Fig. 1⇑B. The control IgG-treated mice exhibited a severe and chronic disease, which was comparable with that in untreated mice (data not shown). The RM134L treatment greatly reduced the disease severity throughout the observation period of 25 days even when the treatment was ceased at day 10 (Fig. 1⇑B). Histological examination showed massive perivascular infiltrates in spinal cords from the control IgG-treated mice at day 12 (Fig. 2⇑, E and F) but only a few infiltrates in spinal cord from the RM134L-treated mice (Fig. 2⇑, G and H). These results indicated a critical contribution of OX40L to later phases of EAE development, including migration of pathogenic T cells into the CNS and reactivation of pathogenic T cells in the CNS. To determine the contribution of OX40L to the development of pathogenic T cells in the actively induced EAE, PLP139–151-immunized mice were treated with RM134L or control IgG from the day of immunization (day 0) to day 7. DLN cells were prepared on day 10, restimulated with PLP139–151 in vitro, and proliferative response was assessed by [3H]TdR uptake and cytokine (IL-2, IL-4, IL-10, IFN-γ, and TNF-α) production was assessed by ELISA. As represented in Fig. 3⇓A, DLN cells from the RM134L-treated mice showed PLP-specific proliferative response comparable with that shown by DLN cells from the control IgG-treated mice. Although IL-2, IL-4, IL-10, and TNF-α were not detectable in the culture supernatants at 24, 48, and 72 h (data not shown), production of IFN-γ was significantly increased in DLN cells from the RM134L-treated mice as compared with that from the control IgG-treated mice (Fig. 3⇓B). These results indicated that the RM134L treatment did not inhibit the priming of PLP-reactive T cells in DLN on s.c. immunization with PLP139–151/CFA but rather enhanced the development of IFN-γ producing Th1 cells, which might be pathogenic. Effect of anti-OX40L mAb treatment on the development of PLP-reactive T cells in vivo. SJL mice were immunized with PLP139–151/CFA and treated i.p. with 400 μg control IgG or RM134L from day 0 to day 7. DLN cells at day 10 were cultured in the presence or absence of PLP139–151 for 72 h. For estimating proliferation, 0.5 μCi [3H]TdR was added during the last 16 h (A). IFN-γ concentrations in the culture supernatants were determined by ELISA (B). Data are represented as mean ± SD of triplicated cultures and are representative of three independent experiments with similar results. ∗, p < 0.05. To more directly assess the development of pathogenic T cells, the in vitro restimulated DLN cells were adoptively transferred to naive SJL mice. 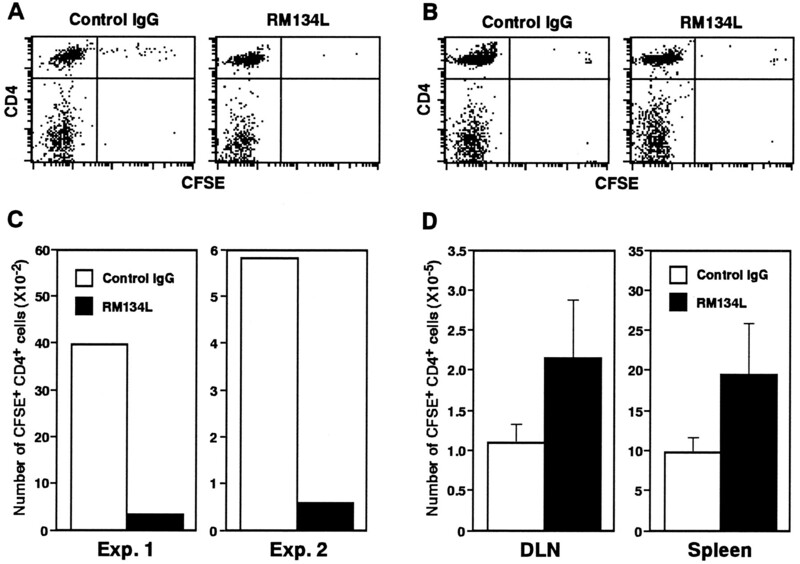 When the mice were transferred with 3 × 107 cells, DLN cells from the RM134L-treated mice exhibited slightly more potent ability to induce severe disease (five of five incidence at day 15) as compared with DLN cells from the control IgG-treated mice (four of five incidence at day 15) (Fig. 4⇓A). This difference was more clearly observed when the transferred cell number was decreased. As shown in Fig. 4⇓B, the mice that received 1 × 107 DLN cells from the RM134L-treated mice developed significantly more severe and chronic disease (four of five incidence at day 15) as compared with the mice that received 1 × 107 DLN cells from the control IgG-treated mice (two of fiveincidence at day 15). These results indicated that OX40L isnot required for the development of pathogenic T cells in the PLP139–151-induced active EAE and may play rather a suppressive role against the development of pathogenic Th1 cells. Adoptive transfer of EAE by DLN cells from the anti-OX40L-treated mice. SJL mice were immunized with PLP139–151/CFA and treated with 400 μg control IgG or RM134L from day 0 to day 7. DLN cells at day 10 were stimulated with PLP139–151 for 4 days in vitro, and then 3 × 107 cells (A) or 1 × 107 cells (B) were injected i.p. into naive SJL mice. Data are indicated as mean clinical score of five mice in each group. Similar results were obtained in two independent experiments. We next examined the contribution of OX40L to the distribution of OX40+ T cells in DLN and spinal cord. PLP139–151-immunized SJL mice were treated with RM134L or control IgG from day 0 to day 14. DLN cells and spinal cord MNC were prepared on day 14 and the presence of OX40+ T cells was analyzed by two-color flow cytometry. As shown in Fig. 5⇓B, a substantial number of OX40-expressing CD4+ T cells were present in spinal cord from the mice with active EAE. In contrast, the RM134L treatment substantially inhibited the distribution of OX40+ T cells, but not that of OX40− T cells, in the spinal cord. On the other hand, OX40-expressing CD4+ T cells were rather accumulated in DLN of the RM134L-treated mice as compared with the IgG-treated mice (Fig. 5⇓A). These results indicated that OX40L plays a critical role in distributing OX40+ pathogenic T cells from DLN to the CNS. Accumulation of OX40+ T cells in draining lymph node and spinal cord. SJL mice were immunized on day 0 with PLP139–151/CFA and treated with 400 μg control IgG or RM134L from day 0 to day 14. DLN cells (A) and spinal cord MNC (B) were isolated on day 14 and stained with FITC-labeled anti-CD3, CD4, or CD8 mAb and biotin-labeled anti-OX40 mAb, followed by PE-labeled streptavidin. The values indicate the percentage of cells in each quadrant. Data are representative of five mice in each group with similar results. To more directly determine the role of OX40L in the distribution of pathogenic T cells, the in vitro restimulated DLN cells were labeled with fluorescent CFSE and adoptively transferred to naive SJL mice, which were then treated with RM134L or control IgG from day 0 to day 7. DLN cells, spleen cells, and spinal cord MNC were prepared on day 10 and the presence of transferred CFSE-labeled CD4+ T cells was analyzed by two-color flow cytometry. As shown in Fig. 6⇓, A and C, the RM134L treatment greatly reduced the number of CFSE+ CD4+ T cells that migrated into the spinal cord as compared with the control IgG treatment. In contrast, the number of CFSE+CD4+ T cells in the DLN and spleen was significantly increased by the RM134L treatment (Fig. 6⇓, B and D). These results indicated that the OX40/OX40L interaction is involved in the migration of adoptively transferred pathogenic T cells into the CNS. Effect of anti-OX40L mAb treatment on migration of CFSE-labeled CD4+ T cells after adoptive transfer. SJL mice were immunized with PLP139–151/CFA. DLN cells at day 10 were stimulated with PLP139–151 for 3 days in vitro and then labeled with CFSE. Naive SJL mice were injected i.p. with CFSE-labeled cells (3 × 107) and treated with 400 μg control IgG or RM134L daily from day 0 to day 7 after the transfer. 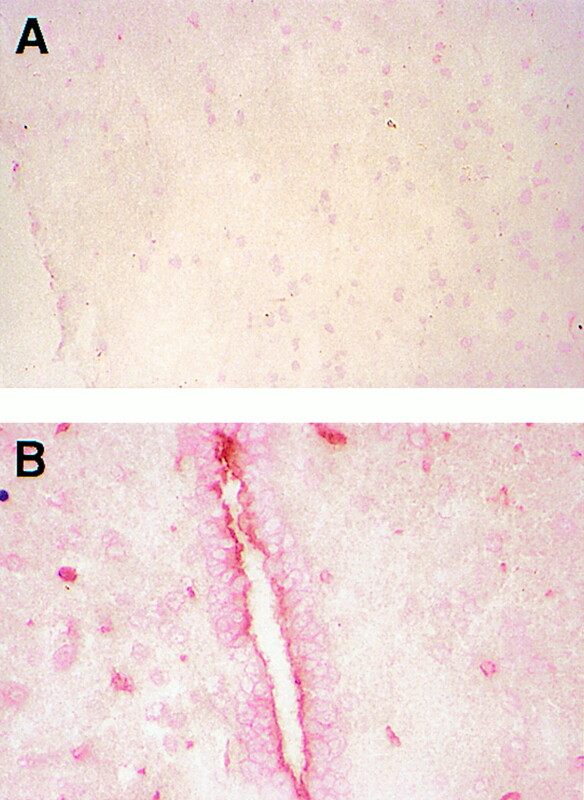 Spinal cord MNC (A) and DLN cells (B) were isolated on day 10 and stained with PE-labeled anti-CD4 mAb. The results from FACS analysis are represented as the number of CFSE-positive CD4+ T cells in the spinal cord (C) and in the DLN and spleen (D). Spinal cord MNC were pooled from five mice, and the data are from two separate experiments as shown in C. Data of DLN cells and spleen cells are indicated as mean ± SD of five mice in each group. In the above flow cytometric experiments, we could not find a significant number of OX40L+ cells in DLN cells or spinal cord MNC (data not shown). We then performed immunohistochemical staining of spinal cords from normal or actively induced EAE mice using RM134L mAb. As shown in Fig. 7⇓B, the most prominent staining was found on vascular EC, which were closely associated with perivascular mononuclear infiltrates, in the spinal cord from mice with active EAE on day 16. Some MNC sparsely distributed in the parenchyma were also positively stained. In contrast, no significant staining was observed in the spinal cord from normal mice (Fig. 7⇓A). These results indicated that OX40L is most prominently expressed on vascular EC in inflamed spinal cord, which appears to be responsible for the accumulation of OX40+ pathogenic T cells in the CNS during the development of EAE. In this study, we demonstrated a critical contribution of the OX40/OX40L interaction to the development of murine EAE, which is a Th1-mediated inflammatory disease of the CNS and a well-established animal model for the human disease, MS. In vivo administration of a neutralizing anti-mouse OX40L mAb effectively ameliorated the actively induced EAE, although it did not dampen the development of pathogenic Th1 cells in DLN. The anti-OX40L mAb treatment substantially inhibited the migration of adoptively transferred CD4+ T cells into the CNS and was also effective in ameliorating adoptively transferred EAE. The most prominent expression of OX40L was found on vascular EC in the CNS with active EAE. Collectively, these results suggest that the most critical role of OX40L in the pathogenesis of EAE is to recruit OX40+ pathogenic T cells to the inflammatory lesions within the CNS. In the present study, we examined the contribution of OX40/OX40L to the pathogenesis of EAE, especially focusing on the development of pathogenic Th1 cells and their migration into the CNS, by using a PLP139–151-induced relapsing-remitting EAE model in SJL mice. The disease course of this model has been well characterized by previous studies (29, 30, 31). The actively induced EAE is initiated by immunization with a PLP139–151 peptide, which is the dominant encephalitogenic epitope in the SJL mice resulting in the priming of PLP139–151-reactive T cells in the DLN. The primed PLP139–151-reactive T cells then migrated into the CNS and were reactivated by endogenous PLP139–151 epitope presented by CNS-resident APC, resulting in the acute disease which peaked around day 15 (Fig. 1⇑A). This acute phase was followed by a transient remission around day 19, which seems to result from activation-induced cell death of PLP139–151-reactive T cells within the CNS (32). The inflammatory reactions at the acute phase induces the release of endogenous myelin epitopes from damaged myelin and activates APC within the CNS, leading to de novo activation of autoreactive T cells specific for endogenous myelin epitopes distinct from the initiating PLP139–151 epitope. This phenomenon, called epitope spreading, has been directly implicated in the occurrence of relapse around day 24 and progression to chronic disease (31). We administered anti-OX40L mAb from the day of immunization (day 0) to day 17 to assess the effect on the development of acute disease. The anti-OX40L mAb treatment ameliorated the acute disease in a dose-dependent manner, and higher doses were also effective in ameliorating the relapse (Fig. 1⇑A). This ameliorating effect on relapse after the cessation of treatment might be simply due to carry over of a sufficient level of anti-OX40L mAb at the relapse phase, which inhibited the migration of pathogenic T cells specific for the relapse-associated myelin epitopes into the CNS. Alternatively, the effect on relapse might be secondary to the amelioration of acute myelin damage, which limited the release of endogenous myelin epitopes and the development of pathogenic T cells specific for relapse-associated epitopes. Our preliminary observation that a short term treatment with anti-OX40L mAb at the remission phase also ameliorated the relapse supports the former possibility. Weinberg et al. (28) recently reported that administration of an OX40-Ig fusion protein at the onset of acute disease (days 12–14) moderately reduced ongoing disease but did not inhibit the relapse. The ameliorating effect of OX40-Ig on acute disease is consistent with that of anti-OX40L mAb that we observed. The failure to prevent relapse might be due to a faster clearance of human OX40-human IgG fusion protein compared with rat IgG anti-mouse OX40L mAb. Further studies are needed to determine the therapeutic utility of anti-OX40L mAb for preventing the relapse and disease progression. Recent studies using OX40- or OX40L-deficient mice revealed a substantial contribution of OX40/OX40L interaction to T cell priming in vivo under certain conditions (18, 19, 20, 21). Chen et al. (20) reported that OX40L-deficient mice exhibited an impaired contact hypersensitivity due to a defect in T cell priming and IFN-γ production, whereas delayed-type hypersensitivity induced by OVA/CFA immunization was not affected. In contract, Murata et al. (21) reported an impaired T cell priming in OX40L-deficient mice immunized with OVA/CFA, which resulted in reduced proliferation and cytokine (IFN-γ, IL-4, and IL-5) production by DLN cells on restimulation in vitro. In our present study, the anti-OX40L mAb treatment did not inhibit the priming of PLP139–151-reactive T cells in DLN on immunization with PLP139–151/CFA as estimated by proliferation of DLN cells in response to restimulation with PLP139–151 in vitro (Fig. 3⇑A). This intact priming of PLP139–151-reactive T cells in DLN might be mediated by costimulatory pathways other than OX40/OX40L, such as CD28/B7. Consistent with this notion, the proliferative response of DLN cells to PLP139–151 re-stimulation in vitro was almost completely inhibited by addition of anti-B7–1/B7–2 mAbs but not by that of anti-OX40L mAb (data not shown). Furthermore, it has been shown that the CD28-mediated costimulation played a predominant role in induction of EAE in SJL mice (33, 34). It is worth noting that IFN-γ production by DLN cells in response to PLP139–151 re-stimulation in vitro was rather enhanced by the anti-OX40L mAb treatment (Fig. 3⇑B). This might be due to accumulation of OX40+ primed T cells in DLN (Fig. 5⇑A). Alternatively, OX40L might play a rather suppressive role against the development of IFN-γ-producing Th1 cells, since we and others have shown that the OX40/OX40L interaction played a preferential role for the development of Th2 cells in vivo and in vitro (15, 16, 17). Our present results clearly indicated that the anti-OX40L mAb treatment inhibited the accumulation of OX40+ T cells in the spinal cord, which was evident at the acute phase in the control IgG-treated mice (Fig. 5⇑B). Weinberg et al. (28) also recently reported that OX40+ T cells accumulated in the brain during the acute phase of EAE, although they have not examined the effect of OX40-Ig on this accumulation. It has been shown, in a rat EAE model, that pathogenic T cells resided in the OX40+ population and that depletion of the OX40+ T cells in vivo ameliorated EAE (25, 26, 27). We also confirmed that the OX40+ T cell population, but not the OX40− T cell population, in the PLP139–151-stimulated DLN cells causes EAE on adoptive transfer also in the mouse system (data not shown). Consistently, DLN cells from the anti-OX40L mAb-treated mice that contained more OX40+ T cells than those from the control IgG-treated mice (Fig. 5⇑A) induced more severe disease on adoptive transfer (Fig. 4⇑). Therefore, the reduction of OX40+ T cells in the CNS appears to be primarily responsible for the ameliorating effect of anti-OX40L mAb on EAE. This reduction of OX40+ T cells in the CNS can be explained by several possibilities. First, anti-OX40L mAb might inhibit the migration of OX40+ T cells into the CNS. Second, anti-OX40L mAb might inhibit the clonal expansion of OX40+ T cells within the CNS, since Weinberg et al. (28) showed that OX40-Ig significantly inhibited the proliferative response of PLP-specific T cells lines to brain APC from active EAE mice in vitro. Third, anti-OX40L mAb might inhibit the survival of OX40+ T cells within the CNS, because the OX40 signal has been implicated in the survival of activated T cells (35, 36). However, our results indicating the enhanced accumulation of OX40+ T cells in DLN of the anti-OX40L-treated mice (Fig. 5⇑A) argue against a requisite role of OX40L for T cell expansion and survival in the second and third possibilities. The inhibitory effect of anti-OX40L mAb on the migration of adoptively transferred CD4+ T cells into the spinal cord (Fig. 6⇑) and the prominent expression of OX40L on vascular EC in the spinal cord with active EAE, which was closely associated with perivascular mononuclear infiltrates (Fig. 7⇑), strongly suggests that the first possibility is most likely. By immunohistochemical staining with the anti-OX40L mAb, we found the expression of OX40L on vascular EC and some MNC sparsely distributed in the parenchyma in the spinal cord with active EAE (Fig. 7⇑B). Weinberg et al. (28) recently demonstrated that a substantial part of CD11b+ MNC, i.e., macrophages/microglia, from the brain with active EAE was OX40L+ as estimated by flow cytometric analysis with OX40-Ig, which may correspond to the OX40L+ MNC in the spinal cord parenchyma we observed. However, our present immunohistochemical staining clearly indicated a prominent expression of OX40L on vascular EC, and its close association with perivascular mononuclear infiltrates strongly suggests that the OX40L molecules expressed on these cells are responsible for the infiltration of OX40+ T cells into the spinal cord. It has been reported that cultured human EC constitutively expressed OX40L, which directly mediated the adhesion of activated T cells expressing OX40 to these cells in vitro (14). We also observed that some murine EC lines constitutively expressed OX40L (unpublished data). However, immunohistochemical staining of human skin tissues showed that the expression of OX40L on vascular EC was confined to the inflammatory lesions (23). We also showed in the present study that OX40L was expressed on EC in inflamed, but not normal, spinal cord (Fig. 7⇑). These results suggest that the expression of OX40L on EC in vivo is not constitutive but inducible in response to inflammatory conditions. Although the proinflammatory factors responsible for the induction of OX40L expression on EC in vivo remain to be determined by further studies, it is highly likely that OX40L expressed on activated EC plays a critical role in recruiting OX40+-activated T cells to the inflammatory sites, thus promoting T cell-mediated inflammatory diseases such as EAE and MS. In such situations, OX40L expressed on EC may directly mediate adhesion of OX40+ T cells as shown in the human system in vitro. Alternatively, OX40L on EC may trigger OX40 signaling in activated T cells, which may activate α4β1 integrin that has been reported to play a critical role in migration of pathogenic T cells into the CNS (37). However, the expression of α4β1 and αLβ2 integrins was not changed on OX40+CD4+ T cells in the DLN of control IgG- or anti-OX40L-treated mice (data not shown). It is also possible that the OX40/OX40L-mediated costimulation may be required for T cells to express some chemokine receptor directing their migration into inflamed CNS, since it has been shown that the OX40 costimulation induced CXCR5 expression in CD4+ T cells, which directed these cells to B cell areas in the spleen (15). Further studies are needed to address these possibilities. We here demonstrated that OX40L appears to play a critical role in directing migration of OX40+ pathogenic T cells into inflammatory sites in a murine EAE model. A similar accumulation of OX40+ T cells has been observed in various inflammatory diseases, including RA, inflammatory bowel disease (IBD), ISD, and GVHD (22, 23, 24, 38). In addition, expression of OX40L on EC has been observed in inflammatory lesions of RA, IBD, and ISD (Refs. 23 and 38 ; our unpublished observation). Therefore, OX40L may also contribute to the recruitment of pathogenic T cells in these T cell-mediated inflammatory diseases, and the anti-OX40L treatment may be generally applicable to ameliorate these diseases. Consistent with this notion, a recent paper showed that administration of OX40-Ig ameliorated ongoing IBD in mouse models by inhibiting T cell infiltration into the mucosa (38). Further studies are now under way to examine the effect of anti-OX40L mAb treatment on the development of other T cell-mediated inflammatory diseases, such as collagen-induced arthritis and acute GVHD, in mouse models. We thank Drs. Y. Iigo and T. Kobata for help in histopathological analysis and Drs. K. Takeda and H. Matsuda for helpful suggestions. ↵1 This work was partly supported by grants from the Ministry of Education, Science, Sports and Culture and the Ministry of Health, Japan. ↵3 Abbreviations used in this paper: L, ligand; EAE, experimental autoimmune encephalomyelitis; MS, multiple sclerosis; PLP, proteolipid protein; DC, dendritic cells; EC, endothelial cells; RA, rheumatoid arthritis; IBD, inflammatory bowel disease; ISD, inflammatory skin disease; GVHD, graft-vs-host disease; DLN, draining lymph node; MNC, mononuclear cells.